With a variety of hand grout pump and air operated grout pump models to choose from, Kenrich Products has the right solution for nearly any grout pumping application. Request a quote to place an order for one of our heavy duty grout pumps or contact us to discuss your specific grout pump needs. Cementitious - Pumps non-shrink sand based cementitious grouts. Heavy Duty - Grout pumps built for durability and long-lasting performance. Hand Operated or Air Operated Grout Pumps - A variety of models perfect for every grout application. Low Pressure - With a 15 psi max, Kenrich grout pumps are deal anywhere high pressure is not required. Lightweight and Portable - Take the grout pump anywhere need to grout. Easy to Operate - Minimal maintenance required. Made in the USA - Proudly manufactured in the heart of the Great Pacific Northwest. 22 1/2" X 10" X 14 1/2"
23 1/2" X 12" X 23"
16 1/2" X 25" X 24"
Must have minimum 3 cfm. continuous compressed air. * These represent standard flow rates. Output and performance will vary depending on the cycle rate, viscosity of mixture and pressure conditions. 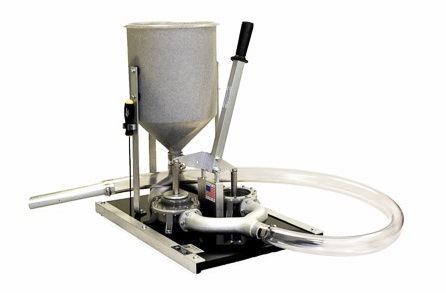 The Kenrich line of heavy duty grout pumps are designed to pump non-shrink sand based cementitious grouts. However, if you need to pump Grout with AGGREGATE, we recommend a factor premix Grout in the bags with no bigger than 3/8” pea gravel. Crushed rock/stone 3/8" in size and larger. Not recommended for jagged edges, even though some contractors make it work. Contact us or call 503-281-6190 for more information. All grout pumps, parts, accessories, and cements are shipped out by UPS to customers the United States and Canada. We offer overnight / next day, second day or third day ground shipping. We can also work with other carriers upon request. Contact us for more information or request a quote to place an order today.